If you've never heard the terms microcreation and macrocreation before, you're not alone. I just saw them for the first time in a an article on eSkeptic: Macroevolution & Microcreationism: Another Flaw in Intelligent Design Creationism. The author, David Eller, makes a clever point that I never thought about. Intelligent design suffers from a problem with macrocreation. The theory purports to "explain" how certain features of cells (like its origin) and slightly larger systems (e.g. blood-clotting) can evolve, namely by divine intervention. Only. But that, of course (even though I had not thought about it) leaves ID with a problem of explaining how speciation and other macroevolutionary events can occur. If they can't by evolution, then does the creator also interfere with processes at a higher level of organization? If not, then are the ID theorists (I'm being generous) admitting that natural evolutionary processes can account for them? However, Behe and most of the effort of the ID movement is not directed at this level or about these questions. They focus on subspecies, microlevel phenomena, like flagella and eyes. Such explanations constitute a kind of microcreationism — claims about how lower-level, intraspecies systems or parts of systems came into being. Microcreation, then, is entirely comparable to microevolution. But neither is a sufficient theory by itself. Evolution demands macroevolution and creationism demands macrocreationism. Following the article are some comments. One is by Armando Simon, who submits that evolutionary biologists are dogmatic, or something to that effect. He thinks that evolution is flawed and speciation is caused by extra-terrestrial impacts. It would require a suicidal degree of stupidity to deny that microevolution happens rather often and easily. Yeah, because you don't get to have antibiotics if you don't believe in evolution. I love it. Come 2013 we can yet again close the case on another deluded creationist. DAVID DUNNING: That’s absolutely right. It’s knowing that there are things you don’t know that you don’t know. Okay, knowing that these things exist is one thing, but it seems more crucial to know what they are. If you don't know what they are, then how can you even know that there are such things that evade your knowledge? So, what things don't you know that you don't know, do you reckon'? I'd make a list, but Denmark-Japan is up. Well, Denmark lost, and that's too bad. Two great, great Japanese goals on free-kicks from 30 and 27 meters made it watchable, though. As for the list, I know there are things that I don't know. And since I keep learning new things that I didn't previously know, including some where I hadn't even known that there was something there to be known, clearly there were things that I didn't know that I didn't know. By inference, most likely there are things that I now don't know that I don't know as well. -Both sides are flawed in their arguments. -Both sides beg the question quite frequently. -Both sides will try anything to "convince." I personally believe in the God of Christianity to be the one and only God. I believe this because I see his creation daily and it is self-evident. Whether or not some form of evolution even exists doesn't matter. It will never, in the end, prove that God does not exist or that the Bible is a lie. I think that science will only get closer to proving God in the end. I feel that everyone has the opportunity to see God through his work in their life and for many reasons people will look for ways around it to benefit their own worldly desires. When you're alone, and you talk to yourself and cry out in fear because you doubt...stop and listen. God WILL speak to your soul and guide you. Remember that He is beyond our understanding, that is why people doubt. Step outside of what you know and try to imagine if you were powerful enough to create all of this and then logically and philosophically work through it all. If you do it without leaning to one side you may find that things look differently. Tell me how I am flawed in my arguments, please. Where do I do beg the question? I will only speak the truth as far as I know it. Integrity is a lot more important than convincing anyone. Where do I do something else to convince anyone, please? If this guy can say "I believe this because I see his creation daily and it is self-evident", then I would say he's already picked a side, quite contrary to what he claims. Also, he doesn't seem to know a lot about either the Bible or science: "I think that science will only get closer to proving God in the end." Check out Jerry Coyne's post about whether Adam and Eve were real. And, he has a foregone conclusion: "It will never, in the end, prove that God does not exist or that the Bible is a lie." If you are settled that that is the case, then how can evidence mean anything to you? Workers washing needles under tap water only to be reused again. Medicine and other vital items being store for months on end, expiring and eventually still applied sporadically to patients. Volunteers with little or no training carrying out dangerous work on patients with highly contagious cases of Tuberculosis, leprosy and other life threatening illnesses, while the workers of the charity patently refuse to accept and implement machinery and equipment that would safely automate processes and save lives. Not once in its sixty year history, have the Missionaries of Charity reported the money they’ve taken in donations, what percentage they use for administration and where the rest has been applied and how. Since its inception, defectors of the organization and other journalists have placed the figure upwards of one billion dollars and counting. The mission currently operates 450 plus homes and maintains an average of 4,000 workers. She was a fanatic, a fundamentalist, and a fraud, and a church that officially protects those who violate the innocent has given us another clear sign of where it truly stands on moral and ethical questions. It's really time for people to stop thinking of her as some saintly savior of the sick and poor, because she was quite the opposite. On Ophelia Benson's blog, Butterflies & Wheels, there was a very amusing discussion (two, actually) running about whether we can scientifically measure God or God’s interaction with the world. Why can’t we scientifically measure God or God’s interaction with the world? One reason could be because god is not there. Another reason could be because god is especially hard to measure for some reason. If it’s the latter we just need better instruments. I think the reason De Dora is suggesting is that god is in principle incapable of being measured. But if that’s the case, De Dora needs to explain further – how he knows that, why it is the case, what it implies for claims about god, and similar. I'd say that we can test some specific hypotheses that involves divine intervention, but not necessarily the existence of God (even if we ignore the boring deism). For example, we should in principle be able to test a hypothesis such as "by miracle, God heals episcopalians from cancer more often than he does the Greek orthodox", or "the flagellum could only have been designed by God". But there are other hypotheses that I would venture cannot be tested. I can think right now of two ways in which God could interact in the natural, non-supernatural world without the possiblity of scientific testing: 1) Personal revelation. This cannot really be tested, because if we show that such events can be caused by some brain dysfunction, then we still cannot rule out that some events are caused by God. 2) If God is very powerful (to the point of being able to do anything), then could he perhaps not also cause miracles and interventions in the natural realm and make it look like he didn't? This seems to be akin to what Ken Miller is suggesting, when he says that God works through changing the probabilities of quantum interactions. Flattered I am, that someone named Clive Bondfield would think to save me from the fraud that evolution is. Subject: Creation is the truth. Bondfield. John 3.16" For God so loved the world that He gave His only begotten son that whoever believes in Him should have eternal life. God did not send His son into the world to condemn the world but that the world through Him might be saved". Keep believing evolution. There are a lot of Christians who also believe in it. If you want to be an atheist that's up to you, but leave our kids minds alone. Even if you are 100% correct you offer NOTHING at the end of the road, so it is just a big ego trip. That doesn't seem very clever to me. PILTDOWN MAN. Fraudently planted modern human skull on to of an orangutang. RAMAPITHECUS. Based on a few fossilised teeth, later proved to be those of a modern orangutang. NEBRASKA MAN. BASED ON ONE TOOTH FROM WHICH A PRIMITIVE MAN AND WOMAN WERE CREATED. LATER THIS TOOTH WAS FOUND TO BE THAT OF A PIG. COLORADO MAN. Based on a single tooth, later found to be that of a horse. PEKING MAN, NEANDERTHAL MAN, CRO-MAGNON MAN. have now bee proven to belong to modern humans. To save you further embarrassment it would be better if you saw that these missing links remained missing. I suggest you add another dimension to your thinkin John 14.6g. To really prove your theory you should also study the Bible, then you would have a comprehensive knowledge of both sides. Jesus said:"I am the way, the truth and the life. No man comes to the father but by me" John 14.6 Clive Bondfield. I can be an atheist, but leave our kids' minds alone?! Which kids? Yours? I am leaving them alone. Mine? None of your business, Clive. All children? Who are you, again, to tell me this? If I am 100% correct then I do too offer something, so it's not a big ego trip (not that I follow the logic). I offer the truth that there is no God, for I follow the evidence. And following the evidence is the only path to truth, and the truth shall set you free. That doesn't seem very clever to you, but that is your mistake. Sahelanthropus tchadensis. Between 6 and 7 million years old. Ardipithecus ramidus. Estimated age is 4.4 million years. Australopithecus anamensis. About 4.0 million years old. Australopithecus afarensi. About 3.4 million years old. Kenyanthropus platyops. Estimated age is about 3.5 million years. Australopithecus garhi. About 2.5 million years old. Australopithecus aethiopicus. Estimated age is 2.5 million years. Australopithecus robustus. Between 2 and 1.5 million years old. Australopithecus boisei. Estimated age is 1.8 million years. Homo habilis. Estimated age is 1.8 million years. Homo georgicus. Estimated age is 1.8 million years. Homo erectus. Thought to be about 700,000 years. Homo ergaster. Estimated age is 1.7 million years. Homo antecessor. This fossil is over 780,000 years old. Homo heidelbergensis (aka Peking man). Have not been proven to be the same as anatomically modern humans. Estimated age is between 400,000 and 700,000 years. Homo neanderthalensis (aka Neanderthals). Are emphatically not anatomically modern humans. Between about 600,000 to 30,000 years old. Please see TalkOrigins for more details. Now, I am no anthropaleontologist, so I cannot assess these fossils, and as I can see, some of them indeed only consist of a few pieces of skull, teeth, and bone, and not complete skeletons. However, the evidence is abundant that there have lived bipedal human-like beings that were not apes and not humans, and this evidence overwhelmingly favors the hypothesis that we humans have evolved from ancestors that weren't anatomically modern humans. Clive is right to imply that it is embarrassing when people build fancy stories out of scarce evidence, and on top of that, when the fossils then turn out to be just an ape or a different mammal entirely. But again, there's plenty of other evidence, and it keeps coming. "I suggest you add another dimension to your thinkin John 14.6g. To really prove your theory you should also study the Bible, then you would have a comprehensive knowledge of both sides." Come again?! If I were to study the Bible, that would help me prove my theory? I actually did read a lot of the Bible (no, not it all), and it seems like a collection of very different stories told by a lot of very different people from very different times. Nothing in there has anything of relevance to say about our origins. Also, the Bible isn't the "other side" of atheism, anymore than the Qu'ran, and all the other scriptures. I believe in things only based on evidence, or absence thereof (yes, absence of evidence does equal evidence of absence, as in "there's no evidence for Unicorns, so..."). In a little blog post about the reluctance to let go of superstition and face up to reality, physicist Sean Carroll laments the fact that most educated people do not appreciate some grand scientific findings. Astrology does not work; there is no such thing as telekinesis; quantum mechanics does not tell you that you can change reality just by thinking about it. There is no life after death; there’s no spiritual essence that can preserve a human consciousness outside its physical body. Life is a chemical reaction; there is no moment at conception or otherwise when a soul is implanted in a body. We evolved as a result of natural processes over the history of the Earth; there is no supernatural intelligence that created us and maintains an interest in our behavior. There is no Natural Law that specifies how human beings should live, including who they should marry. There is no strong conception of free will, in the sense that we are laws unto ourselves over and above the laws of nature. The world follows rules, and we are part of the world. Astrology works to provide a platform for talking about oneself in a setting where other people are willing to listen, and it works to put money in the pockets of frauds. There is such a thing a telekinesis. I practice it myself. I haven't actually gotten it to work yet, but I try hard. Quantum physics tell different people different things. Personally, I need people like Sean to tell me what it says, but other people listen to Deepak Chopra, curiously. There is life after death. My life after yours. My children's after mine. It may be that our personalities/consciousness could be uploaded to a computer, but otherwise no spirits beyond the drinkable ones. Soul. Okay, there is just no freakin' soul. There is certainly no evidence of any supernatural being who cares. But that is the same thing. If there was a natural law that dictates how we must behave then why can we break it? Then why must other people guard that law? There is no free will, because there is no you. When I was a child we often said, "if I were you I'd do something different", but I thought that if you were me, then you'd be me in everything, and you'd do the same as me, and that in a sense, you are me. The you is the everything. There are two kinds of comments: spam and other. I get more of the former, unfortunately, but thankfully spend next to no time on moderation. 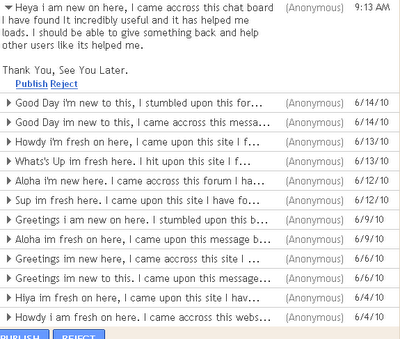 Mostly the spam is lots of URLs for sites that make money somehow (shoes and pr0n), but lately I have been getting a lot of comments just saying hi. There's no link to any website, and the comments aren't at all inflammatory, but... they also say nothing of value or on topic, and they keep coming back. 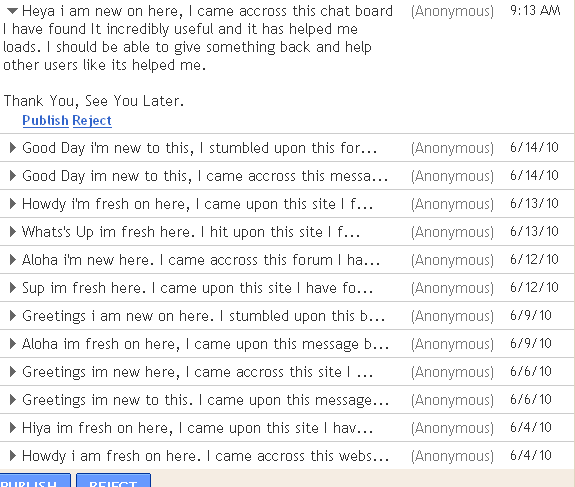 The funny thing is that all these messages are clearly from the same user, since the wording is too close not to be. But, none of the comments are identical, just very similar. What the hell is the point? The only possible answer I have is that they are submitted to see if there is a spam filter in place, and if I'll publish them. But to what use? In the third video in the series of Dr. Jobe Martin's Increadible Creatures that (he thinks) Defy Evolution we get a lot more of "I don't see how evolution can explain that". Literally, that's what he says. Again. But, we also finally learn what "evolution's assumptions" are (it's in the bonus material, so perhaps I just missed it the first two times around). I'll let Dr. Jobe Martin speak first, and then get to the rebuttal. #1 Spontaneous generation occured*: non-living things gave rise to living material. "Why is this an assumption? Because they can't make it happen." #2 Spontaneous generation occured* only once. "The probability of 200 amino acids bonding together to become a simple protein is something like one to the 141st power. That's a minus 141st power, so we're not thinking in fractions. That would be a one with 141 zeros after it. And that's one of the reasons the evolutionists make this assumption, which then leads to the third assumption." #3 Viruses, bacteria, plants & animals are all related. To paraphrase: "In textbooks different (living) species are drawn as tips on a phylogenetic tree with lines that lead to the origin of a single cell. But there's nothing on the lines. Well, why is there nothing on those lines? Well, because those are the missing links, see. There's nothing there because there's nothing there. It's an assumption that there something there, when there's not." #4 Invertebrates gave rise to verebrates*. "We don't know that, because we can't make it happen." #5 Fish gave rise to amphibia, the amphibia to reptiles and reptiles to birds & mammals. "Is there any such thing as let's say a lukewarmblooded, semi-dense boned creature in between reptile and bird? No." Also, "leading evolutionary thinkers now are telling us that archaeopteryx is a pure bird." "So, this whole idea of big bang, macroevolution is based on a whole series of pure assumptions. It is a faith system." And those are the so-called assumptions that evolution supposedly rest upon, according to Dr. Jobe Martin. He is, of course very wrong on several accounts. First of all, belief that an event took place need not be an assumption of faith just because we cannot reproduce the event today. But, it is true that in science - where we look for natural explanations only - we started by guessing that life arose from non-living matter. Why? Well, because the only other option is that it was always there, and since we have found out that the Earth formed at some point, and there's no evidence of life before Earth, life must have come later. It's an inference: from what we understand of nature, and from the evidence available to us, the only sensible conclusion is that life came from non-life. But, having said that, scientists don't stop there. No, we cannot exactly reproduce abiogenesis in the lab. Yet. But people are working hard on it, and molecules have been shown to self-replicate (Self-Sustained Replication of an RNA Enzyme). Abiogenesis probably happened only once, yes. It was an unlikely event, and once it happened, that life would be eating other molecules, making the event even more unlikely to happen again. But, so what? It's not an important assumption that means anything. The third "assumption" that all life is related, is not based on that, but on homology. Cells in plants, fungi, protists, animals, archaea, and bacteria (the six kingdoms) are similar on many levels, and the most sensible inference is that they then have a common ancestor. However, Dr. Martin has it wrong that viruses are supposed to share an ancestor with the rest of us. Viruses aren't even cells. Dr. Martin's claim that there are no transitional fossils is hogwash. It's a tired, boring, annoying claim that has been dealt with sooo many times before. How can anyone claim to know anything about evolution without any knowledge about any of those "missing links"? Answer: only someone either lying about their credentials or about the evidence. Archaeopteryx is not a pure bird. It has many features in common with reptiles. Dr. Martin holds that evolution is a faith system, and that his belief in creationism is based on evidence. The evidence that he has presented is that many creatures defy evolution, simple - literally - because he cannot see how they could have evolved. Again, I counter that that's because i) he doesn't know enough about evolution, ii) we don't know everything about evolution, and iii) he wants his faith-based belief (which is based on words in a book) to be true, and it conflicts with the scientific consensus (which is based on evidence). Here's Tim Minchin on that Good Book. I ♥ Tim. * As spelled in the video. What kind of life did he expect, anyway? Animals large enough to spot with the eye? Animals tasting of something else than peanut butter? I've eaten my share of peanut butter, and while I have never found new life forms in there - indeed, any life forms - I trust there are bacteria in it, and I trust that I wouldn't be able to tell the difference between common bacteria and new peanut butter life forms. As a first time offense, I am featured in the Carnival of the Godless #143 on Reverend Atheist. QUESTION: Most astronomers believe the universe formed about 13.7 billion years ago in a massive event called the Big Bang. Do you think that's about right or do think the universe was created much more recently? It's no surprise that the more to the right people are politically, the less scientifically literate they are. It's well known. But there is good news in here (it's not really news, since it confirms previous polls like this): The fact that the younger people are the more likely they are to believe what scientists say (as opposed to what their religion says on the matter) is great news. It suggest things are going to go in the right direction. As I mentioned a couple of days ago, I was kindly sent a package full of creationist promotional material. 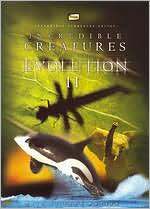 I already watched and then dealt with the first of the films, Incredible Creatures that Defy Evolution I. Now I've watched the second in the series, and I really don't feel like writing a long take-down of Dr. Jobe Martin's pathetic (in terms of pathos, i.e., emotional) arguments against evolution and for Christianity. Instead, here are the most memorable quotes from it. Evolution teaches that whales are really a land mammal that decided to go back into the ocean. God made whales so that when they breathe through their blowhole, they do no have any connection to their mouth. Now, we have a connection, mammals have connection between the nose and the mouth. You can get a nose full of water, it can come down in you mouth. You can get stuff in your mouth. Little kids, it's always coming out of the nose. With a whale, how are they gonna eat? They're gonna open they mouth, and sometimes under large amounts of pressure, fill up they mouth to eat, so their mouth and their nose aren't hooked up. How do you have a slowly evolving something into something else, where you can't have a partially unhooked up system. It's either totally unhooked up, so that you can't drown, or it's not. And, so I don't see any evidence that land mammals have migrated into the ocean, and become whales, and porpoises, and dolphins, and all those kinds of things. I don't think we have any evidence for that. It boils down to this. Whales are amazing (we all agree). Dr. Martin can't understand how they could have evolved. Also, he willfully ignores the evidence that exists that whales evolved from land mammals. So he can see no evidence that whales evolved. Rather, God made them. "Only God could do that, because the evolutionary explanation doesn't fit." "No way that evolution has the answer for those kinds of things." "That's a miracle. I don't know how else to explain that. I think our lord is amazing." "Where would that come from? I mean, how would that ability evolve? How many billions of years would it take for a hippopotamus to get those glands just right?" "In any event, these are just some more things that God has done. There so much that we can learn, so much more that we can learn about these things that God has made." "Our God, he's amazing. The things that he has thought up... He started with nothing. We have all these things to work with. He started with absolutely nothing, and though up all these things up, and they work. I mean, that takes incredible genius, and wisdom, and power. And that's our God, the God of the Bible." "The fat in the bear breaks down. Each gram of fat gives off a gram and a half of water." ---- Now that's magic. That I cannot explain. "But if you try to grab them [earthworms], they can go in reverse! So, they can not only crawl forward, they can go in reverse, and pull back into their hole! That's marvelous!" "As we look at these things, it should make us think 'you know, I see design here. I see some sort of of creation here. I see something that looks like it's been made. It doesn't look like it's just a mindless, random chance process that has produced this thing'." I know not everyone will feel as queasy and giggly at the same time as I do reading these quotes, but that's the test. If you think he is making sense, then probably no sense will ever do it for you. I presume you are the intended target of these videos. Since Zen Faulkes is a brainy scientist, we thought it might be fun to have a special CoE edition on all things brain evolution. 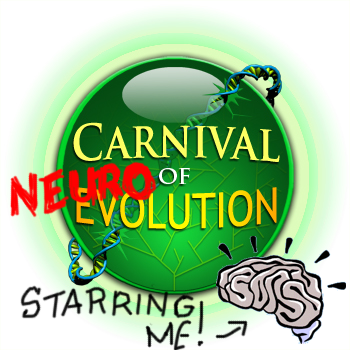 It is now up on his blog, NeuroDojo. I like it a lot, but I like a good lawsuit even more. Evolutionary changes in brains must often force evolutionary changes to occur in other structures, not the least of which for the vertebrates in the skull. The complex relationship between brains, faces, and skulls in primates is discussed over at A Primate of Modern Aspect. Next month the carnival will be hosted by Hannah on Culturing Science, winner of the Research Blogging award for Best New Blog 2009. Expectations run high.